Senior U.S. District Judge Ivan Lemelle on April 3 was presented with a motion to dismiss the case by the plaintiffs with prejudice on behalf of Dimitri Frazier, Tiffany Turner and Adonte Turner, the three individuals who were asking for $1 million in damages from Mississippi-based Whitestone Transportation in connection with an alleged accident in New Orleans in 2017. Because the case was dismissed with prejudice, the lawsuit cannot be refiled by the plaintiffs. In court documents, attorneys for the trucking company allege the accident, and possibly as many as 30 other accidents in the New Orleans area, was staged. The dismissal follows a request last month by the plaintiffs to postpone the trial, originally set for March 18, after their attorney said they would assert their Fifth Amendment rights to not incriminate themselves due to a possible criminal investigation. Affidavits filed by the three plaintiffs did not specifically identify the law enforcement agency they believed was conducting the investigation, but they said they would decline to testify if the trial proceeded. Edwin Shorty Jr., a New Orleans attorney who was representing the plaintiffs at the time, said he had seen nothing to substantiate the trucking company’s claims that the accident was staged. Shorty said he first learned of the possible investigation during a pretrial meeting, where the trucking company attorneys said they had been contacted by the FBI and the U.S. Attorney’s Office about similar incidents. While Shorty claimed in court documents that the defendants said his clients were under investigation, the trucking company attorney said they never specifically named the three individuals. Shorty has since removed himself as counsel of record for the three plaintiffs. 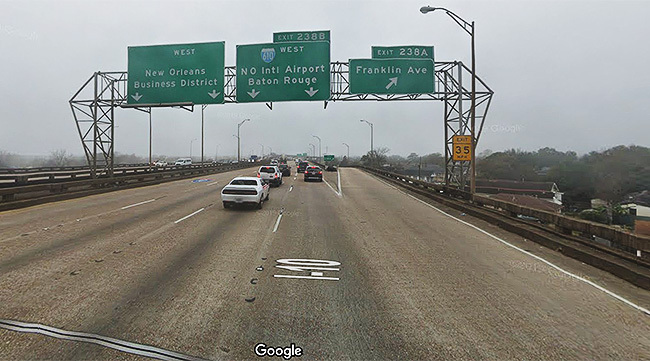 The alleged accident that prompted the lawsuit occurred on Nov. 13, 2017, on Interstate 10 in New Orleans, when a motorist flagged down Whitestone driver Robert Runnels to inform him that his 18-wheeler had sideswiped a car. But when the driver checked his truck, he saw no damage and the truck’s onboard data system did not document any type of impact. They also were seeking damages for medical expenses, mental anguish, loss of enjoyment of life, physical pain and suffering, and inconvenience. But attorneys for the trucking company alleged the accident was staged for the intention of reaping a large financial court settlement. In the course of investigating the accident, Whitestone attorneys alleged in court documents that they uncovered evidence that more than 30 other accidents in New Orleans had similar “factual scenarios” and were believed to possibly have been staged. Whitestone’s attorney, Guy Perrier of New Orleans, declined comment on the motion. Shorty could not be reached for comment.